“You actually have to see it to believe it,” says Alain Bachmann as he looks out across the paddy fields that surround the Chedi Club Tanah Gajah, where he is general manager. It’s a claim often made, but seldom with so much justification. Built in the early ‘80s as the family estate for one of Indonesia’s leading architects and interior designers, Hendra Hadiprana, the Tanah Gajah was taken over about 10 years ago by hotel management group GHM, although Hadiprana retains ownership. As such it lacks the corporate template that dominates so many hotel resorts around the world. Works of art selected by Hadiprana, who is a patron of the country’s vibrant creative scene, are sprinkled across the estate in a haphazard manner that reflects the owner’s personal taste rather than an unyielding design motif. The Club retains the ambience of a family estate while providing the service of a five-star resort. For once, your personal butler seems in keeping with the timeless atmosphere rather than a marketing gimmick designed to increase the room rate. “You don’t feel like you are arriving at a hotel,” says Bachmann. And once more he is right. It’s more like Bali’s Downtown Abbey than a chain resort. 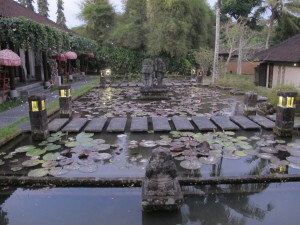 Despite the addition of some pool villas, a larger swimming pool and the restaurant in which we are enjoying breakfast, Tanah Gajah remains relatively untouched from the days when the Hadipranas used to host Indonesia’s rich and famous. Above all there is a sense of space – timelessness and space – created by the five hectares of land filled with lily ponds and mature trees, surrounded by a sea of paddy fields, left untouched by the crazy speculation that has infested this tourism-gilded island. “People want their own space nowadays,” says Bachmann. “That is the new luxury. People come here to experience that.” I just feel fortunate to have been invited for a few days to join this illustrious club. Words & Photos by Mark Bibby Jackson.